HVACR certified technicians with over 40 years combined experience. We stock a very extensive supply of parts in our on-site warehouse to ensure a rapid response to your service challenge. 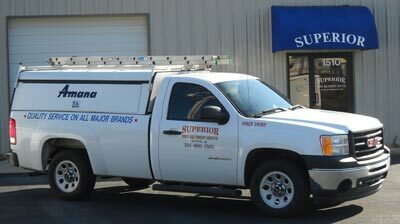 Superior Food responds to repair requests for almost every major manufacturer of commercial food equipment. Welcome to Superior Food Equipment Service. Since inception of 1996, we have become your one stop service company for your entire restaurant repair needs. Our HVACR certified technicians with over 40 years combined experience are well competent in all variations in the food service equipment repair field. They will deliver a higher first time fix rate, thereby keeping your downtown to a minimum. We pride ourselves on doing everything in our power to get your equipment back up and running as soon as possible. We stock a very extensive supply of parts in our on-site warehouse to ensure a rapid response to your service challenge. Also, if we don’t have the correct parts in stock, we usually obtain them within a few short hours or days depending on the urgency of your repair or service needs. We provide this level of service while also offering preventative maintenance packages to help ensure minimum downtime on equipment repairs. We service all makes and models of Restaurant Equipment, anything from fryers, ovens, ranges, griddles, steamers, kettles and mixers to all types of refrigeration equipment – from walk-in coolers and freezers- to reach-ins, prep tables, mug chillers, blast freezers, etc. – Almost any manufacturer and any model. We also specialize in Ice Machines from Hoshizaki, Manitowac to many others like Ice-O-Matic and Scotsman. Superior Food responds to repair requests for almost every major manufacturer of commercial food equipment. Please visit our Products and Services page for more information. Copyright © 2010-2018 Superior Food Equipment Service Company. All Rights Reserved.